The first rays of light break through the horizon, slowly pulling the veil of night off the land. As day takes over, the chill of the night breaks, causing gently wisps of fog to creep forth from the water, as if to attempt to pull the blanket back for a few more moments of sleep. The only sounds are the waking birds, followed by the zinging of the line peeling off the reel as you make the first cast. The lure smacks the water, breaking the glassy calm of the surface. The fish rises and strikes almost immediately and the struggle begins. You are alone in the battle. There is no one else there. It feels like there might never have been. That is the adventure that awaits you. Fishing is a sport that so many enjoy. With a whopping nine percent of Canada being water, finding a place to fish isn’t difficult. Finding a remote spot to fish, however, can get a little tricky. Thankfully there’s a fun way to find those hard-to-reach spots, and it doesn’t involve a plane. 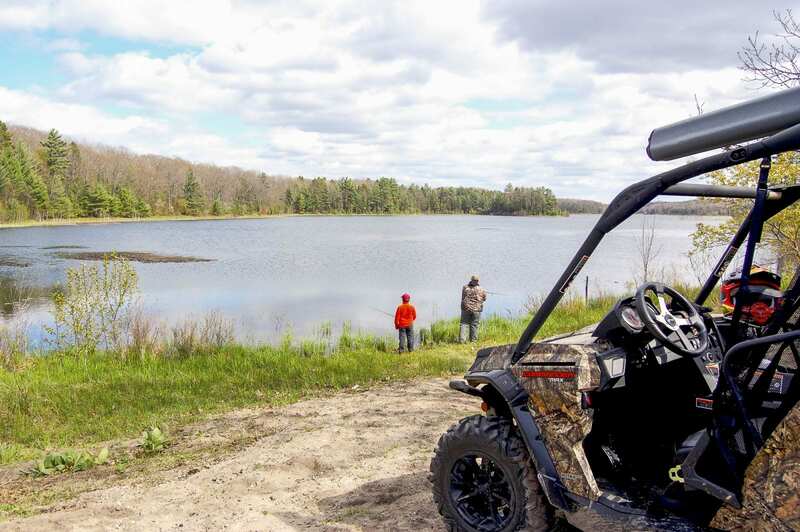 Using your UTV to go on an adventure fishing trip takes two things you know you love – driving your UTV into wild places, and fishing on waters that seldom if ever see another angler – and combines them into a trip that you’ll remember for years to come. 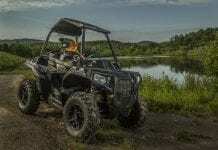 A UTV is the perfect platform for a day-tripping fishing adventure. Oh sure, you can pack in a tent, sleeping bags and all the other camping gear needed for overnight trips to the wilderness, but for the sake of discussion, let’s just chat about a day trip. 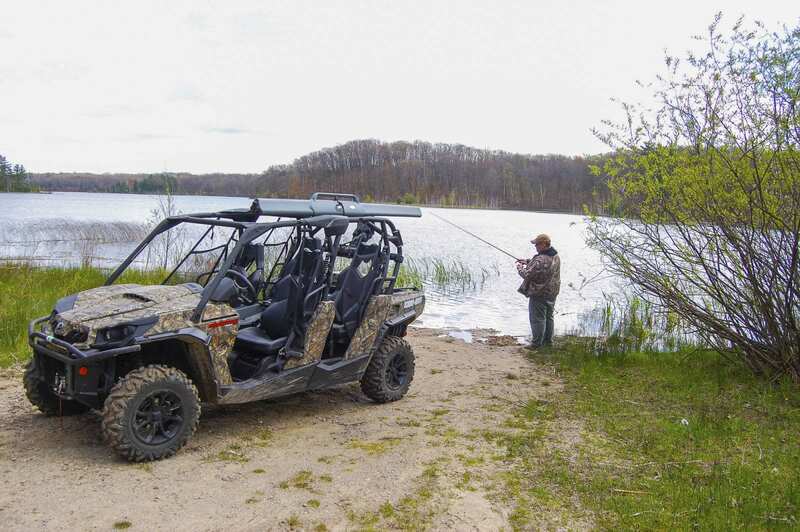 The 2016 Can Am Commander Max XT is a perfect platform for adventure fishing. The 85-horsepower Rotax V-twin engine gives you enough power to haul you and three passengers, plus all of your gear just about anywhere. The cargo bed has ample space for a decent sized cooler, such as a Yeti 45 quart. The secondary cargo box is a great place for smaller things, like a tackle box, and rain gear. 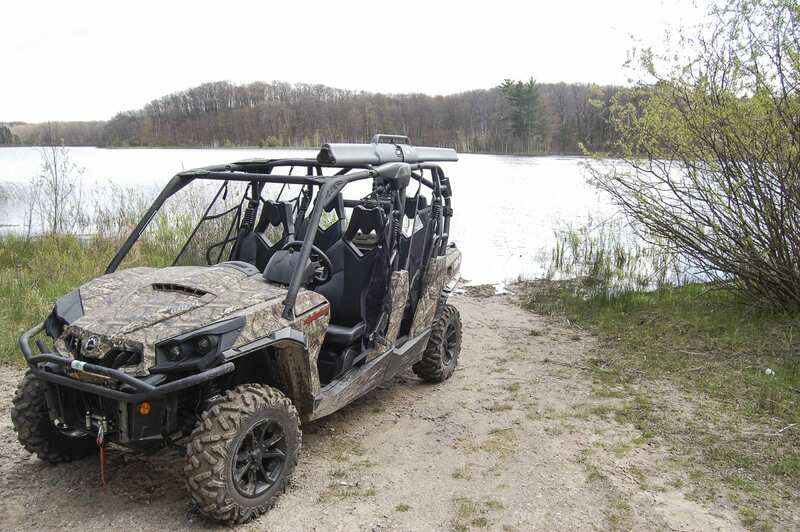 The 2016 Can Am Commander Max XT is a perfect platform for adventure fishing. The roll cage is a great place to strap down a rod tube. Using a rod tube helps in several ways. It keeps your fishing rods from bouncing all over the machine. 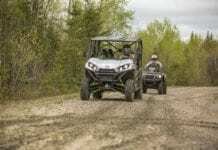 Any UTV is going to have some vibration, and just about any rod can be damaged by the rubbing that can take place when it is against metal, plastic or other materials. A rod tube will prevent that as well. The most important reason to use a rod tube is simply to protect the rods from snagging on trees and other brush as you go on your adventure. It keeps them from being damaged, or being lost, either of which could ruin a fishing trip. 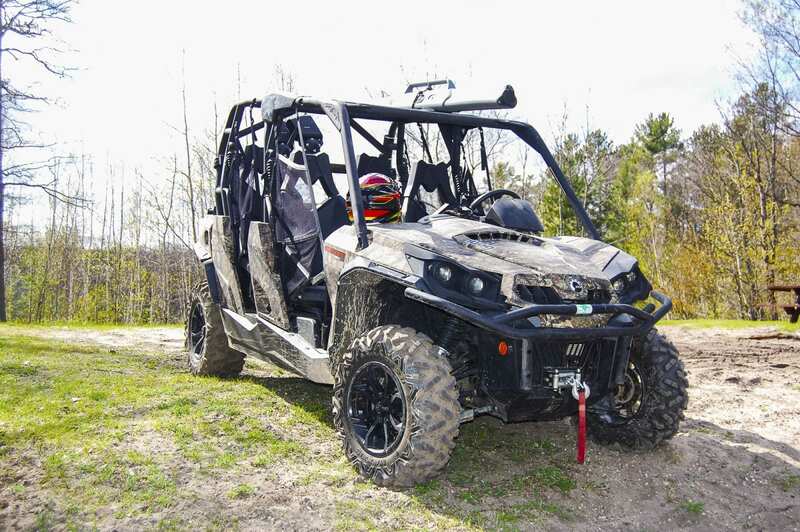 There are always things you should carry with you in the UTV whenever you’re adventuring. Making that adventure a fishing trip just adds a few more. You should carry with you a flashlight and spare batteries, basic tools, spare parts such as a drive belt, and a spare key. There are other items we could add, such as duct tape, zip ties, a tire pump and plugs, but you probably already have all of that, right? 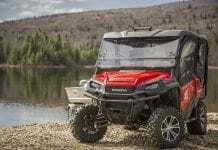 Another nice feature that makes the Commander XT package so appealing is the inclusion of the 4,500 lbs. Warn winch. A winch is one of those tools that you sometimes think you don’t need, and then find yourself really appreciating when you do need it. For an adventure fishing trip, you should also bring along your cell phone and a way to charge it. If you’re thinking of having a shoe lunch, you should have fire starting materials, such as matches or a lighter. A small shovel, such as a folding pack shovel is nice for helping put of any embers when you’re done with the fire. Another nice feature that makes the Commander XT package so appealing is the inclusion of the 4,500 lbs. Warn winch. A basic first aid kit should be in your machine already. Make sure you have extra bandages, gauze and tape. The number one injury during fishing trips is a cut. The other is the dreaded hook-through-the-skin. If you inadvertently hook yourself, or a buddy, take a pair of pliers and turn the hook until the barb comes back out. Then clip off the barb. This will let you pull the hook back out. As long as you don’t hook something bad, like an eye, you should be able to take care of this with bandages and antiseptic. One of the many reasons you should wear sunglasses while fishing. Make sure you bring along enough bait and tackle. You don’t want to work to get back into the perfect spot, only to run out of the one type of bait the fish were really hitting on, do you? Hey, it happens to all of us at some point. Plan ahead! Know where you’re going too. A GPS is a great tool for navigating back into the wilds. Take a look at where you think you want to go and program it into the GPS beforehand. Yeah, you’ll undoubtedly get sidetracked, or drawn into a different spot. The real reason to plan out at least somewhat beforehand is to be able to give someone an idea of where you might be, just in case you don’t come back. It may not be for a bad reason, but there is always the unknown that can happen, especially if you add water to the mix. Let someone know, or at the very least, write it down and leave it where someone might be able to find it. We’ve all seen the movie where the innocent family heads out for a fun day or adventure and fishing, only to be savagely attacked. Well, it may be a bit farfetched, but it is also a guarantee that something is going to try to feed on you when you go fishing, especially in the wild – mosquitos! Being near water means dealing with these micro-sized vampires, and it seems that the more remote you go, the more of them there are. Be sure to toss some serious mosquito repellant in your UTV. Another option too, is the Thermacell appliance. They offer several and they actually do work. You’ll find the Thermacell will work best on calm days, so you might have to use a combination. As for anything toothy, you really don’t have much to be concerned with. Make some noise, let them know you’re there and if you have to run, only do so in your UTV. 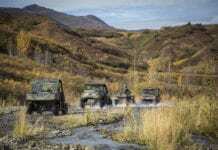 A Can Am Commander can outrun a bear most of the time. 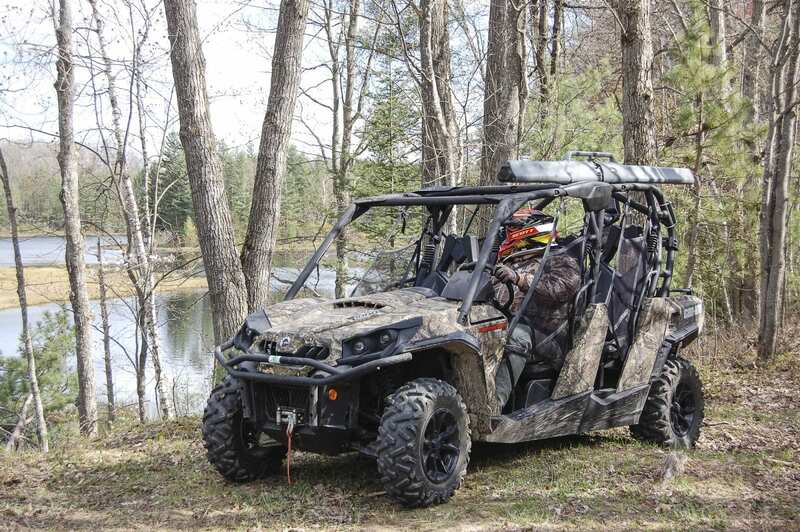 While the manufacturers never recommend it due to legal reasons, the roll cage, especially on a four-seat machine like the Commander Max, offers up ample room to tie down a small boat, canoe or even a pair of kayaks. The ability to get out on the water opens up more possibilities when angling for adventure. The Commander Max, offers up ample room to tie down a small boat, canoe or even a pair of kayaks. A favorite technique with a kayak is to have a rod holder of some kind mounted to the boat. Cast a lure, such as a Rapala out. You then put the rod in the holder and slowly paddle along, trolling the lure behind you. Predatory fish, like northern pike or walleye, will smack the lure pretty hard. Ever been dragged around by a pike while fishing from a kayak? It’s a lot of fun. This technique also works in rivers. You drop the lure in and then use the paddle to slow the boat against the current. This lets you walk the lure down the river and it is very effective for trout, steelhead, and salmon, as well as the aforementioned pike, walleye and even muskies. One thing to note, when you’re fishing in remote locations, be it if you are wading, using a small boat, or even alongside the shore, think very carefully about using a life preserver. One of the inflatable ones doesn’t add any bulk and is cheap insurance against not coming home. It’s like wearing a helmet. You wear it not for the things you can think of, but the things you can’t. The reward is the journey and the memories you’ll make. 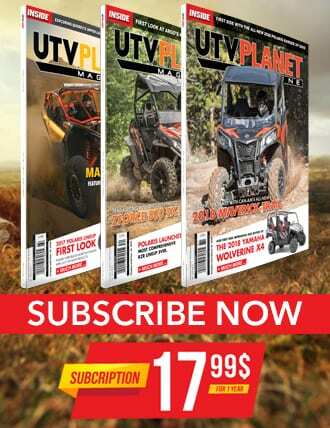 We all love to drive our UTVs because of the fun and freedom they provide. They can go places we wouldn’t take a truck, and have a ton of fun while getting there. They are the perfect vessel for an adventure fishing trip. You just have to plan accordingly. Know going into the trip that you are going to have to do some extra machine prep work, mostly to secure everything so that the trip is free of the drama that can come from damaged or lost gear. The reward is the journey and the memories you’ll make. The best part of a trip like this is, once you do it the first time and see what you did right and wrong, planning out the next adventure is that much easier. And if you’re anything like us, the next adventure is always right around the corner.